I dont have any clue on that one for you guys.. unless your browsers are not saving cookies. I know it works for me and it seems that you two are the only ones experiencing it.. or are at least vocal about it. There are pending updates to the board so maybe that will help? Nothing specific in the release notes about that specific issue though. 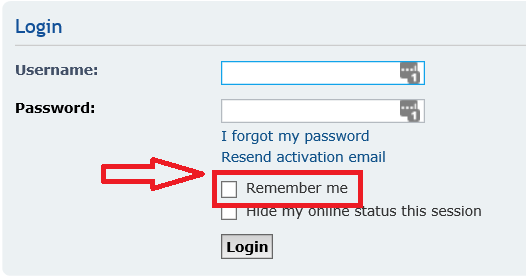 Oh, also i am assuming that you are clicking the checkbox when logging in to remember you? Also the "remember me" key expiration is set to 10 days. Is it over 10 days that you go without visiting the board? Nope, I cannot stay logged in either. This is the only web site that acts this way. Remember me doesn't like me. I`ve taken them off my Christmas card list. Yup, cookies turned on. Remember me checked. This is the only site I visit that does it. You can get more power out of ANY engine!!! Still can't stay logged in, but after being forced to reset my password, I only have to log in once each session now. Back to having to log in twice every time. Nothing at all has changed. Still need to do the next update.. just been on the back burner. Seems only a couple of you have this issue.. Thanks for looking at the updates. I'm not sure if only a couple of us are affected or only a few have read this post and commented, but either way, I'll be a happy camper when it's fixed. Thanks for keeping at it! Same thing happens to me. I have to log in every post I make, or any time i close the tab. Still having this issue. Had to log in like 6 times today while updating my build thread. Sometimes this is linked to safety settings. I do not remember the details - had similar problems in the past on different forum. After loosening the safety rules in the browser it worked fine. Maybe, but there is no rule saying "for just jeepstrokers.com don't save my password" and it doesn't happen on the other 40 forums i am logged in to.